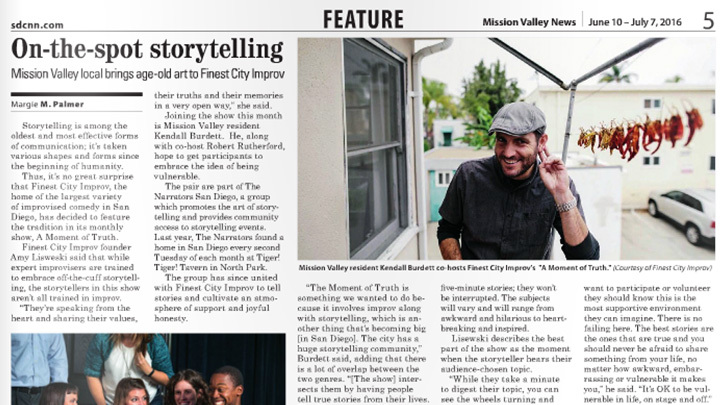 Our show “A Moment of Truth” and ensemble member and show host Kendall Burdett were featured this week in local publication Mission Valley News. Storytelling is among the oldest and most effective forms of communication; it’s taken various shapes and forms since the beginning of humanity. Thus, it’s no great surprise that Finest City Improv, the home of the largest variety of improvised comedy in San Diego, has decided to feature the tradition in its monthly show, A Moment of Truth. Finest City Improv founder Amy Lisewski said that while expert improvisers are trained to embrace off-the-cuff storytelling, the storytellers in this show aren’t all trained in improv. “They’re speaking from the heart and sharing their values, their truths and their memories in a very open way,” she said.